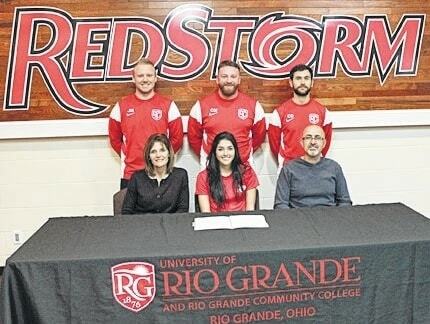 River Valley’s Rachel Hadded recently signed her letter of intent to join the Rio Grande women’s soccer team. “I’m excited and I can’t wait to play competitive soccer again,” said Haddad. I just want to contribute to the team in a positive way, both on and off the field.” Haddad, a 5-foot-5 midfielder who began her high school career at Ohio Valley Christian, transferred to RVHS, which doesn’t have a soccer team. However, Rachel continued playing soccer as a club sport in West Virginia. “I already have two years completed at the university and I thought playing soccer for my last two would only add to my college experience,” said Haddad. “I grew up here, I’ve attended multiple camps and I’ve watched the program improve into one which I believe I can come into and help out.” Haddad also participated in track and field during the course of her high school career. “Rachel’s a local girl who I’ve known for a long time. She comes from a family who knows the game really well – her dad played in Israel – and she has all kinds of ability,” URG head coach Callum Morris said. “She took a couple of years off for a couple of different reasons, but if we can get her firing off all cylinders, she can be a very good player for us. Technically, she’s a sound player.” Pictured above, sitting in front from left, are Julia Haddad, Rachel Haddad and Jamal Haddad. Standing in the back are Rio Grande assistant coach Jack Marchant, Rio Grande head coach Callum Morris, Rio Grande assistant coach Craig Davies.